Just picked this up at my local Woodcraft. For about the same price as a Norton 4000/8000, it has a dual personality in that it is more aggressive than a 4000 stone, yet gives an equivalent edge to the 8000 Norton. I must say that it does not give the polish that an 8000 Norton stone does, but diamond stones have to be broken in for a while. Since this is my first diamond stone, I’m not sure how long that will take, and may end up using the rest of my Norton 8000, or a strop, until that time comes. One thing I really like, other than that it never needs to be flattened, is that I can use it wet or dry. Wet seems better as its really abrasive, so the water is a good lubricant. I may try a bit of soap in my spray bottle though. I’m also looking forward to sharpening my carving chisels without worrying about wearing grooves in my water stones. Of the couple I’ve sharpened so far it works great. I plan on a sharpening day in the shop soon. Something I’ve never done before because of the amount of time it would take to sharpen every edge in my shop. Hopefully that will help break in my new sharpening friend! Hey, never had one of these before. Wow, is it handy! This is the Lee Valley Veritas cabinet scraper. It is sharpened differently than a chisel or plane blade, but it’s really easy. Plus it has two burrs, once you go thru one, you have another ready to go. Here’s a few pics and it being used on zebrawood for a morning bar top. Gets rid of any tearout very nicely and leaves the surface ready for a card scraper or sandpaper. I like it much better for flat surfaces because the bottom registers flat, as opposed to a card scraper. I actually like it better than my smoother because it’s fast. It’s important to follow the instructions carefully, as they get you off to a great start in understand the sharpening process. Here’s a link to a great video on Fine Woodworking by Phillip C. Lowe about the use of cabinet scrapers, scraper planes, and hand scrapers. You’ll never know how valuable and time saving this new product is until you actually use it. Well, you don’t actually “use” it because it’s totally automatic! Once set up and getting familiar with the options, I couldn’t be happier. That’s because I no longer have to open blast gates when I go to a piece of power equipment, and I no longer have to remember to close a blast gate when I’m done. Here’s what the blast gate looks like hooked up to my planer. I’m a big fan of all the iVac accessories. I started with the iVac switches a couple of years ago that automatically turned on and off my Rikon 1hp dust collector. Below is one of the original switches, which has been relegated to my shop vac that’s hooked up to my router table and chop saw with 2.5″ lines and manual blast gates. iVac doesn’t have blast gates for 2.5″ yet but if they did I’d get them. 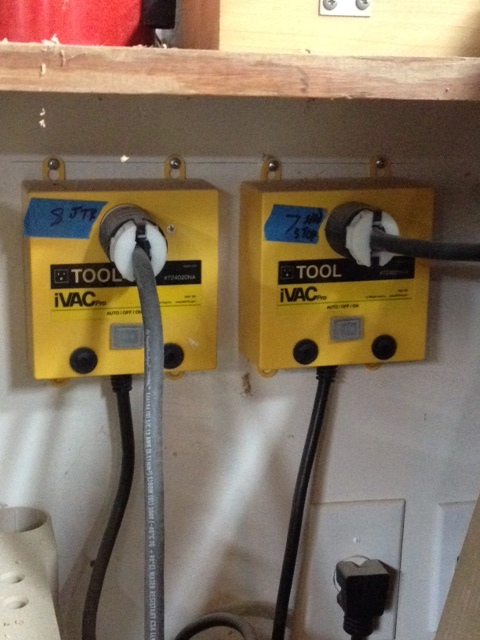 iVac Switch for 110v router table and chop saw. More recently iVac came out with the Pro line which accommodates the blast gate shown above. After having difficulty sourcing them, I found them on the Lee Valley website at an introductory price. It was between $200-300 for a two blast gate setup if I remember correctly. Nowadays they are available most everywhere, and sometimes on sale. You simply plug both the dust collector and machine power cords into the switch, and viola, when you turn on the table saw, on comes the dust collector and the gate opens. When the table saw is turned off the dust collector continues to run and shuts off after the lines are cleared, then the blast gate closes. 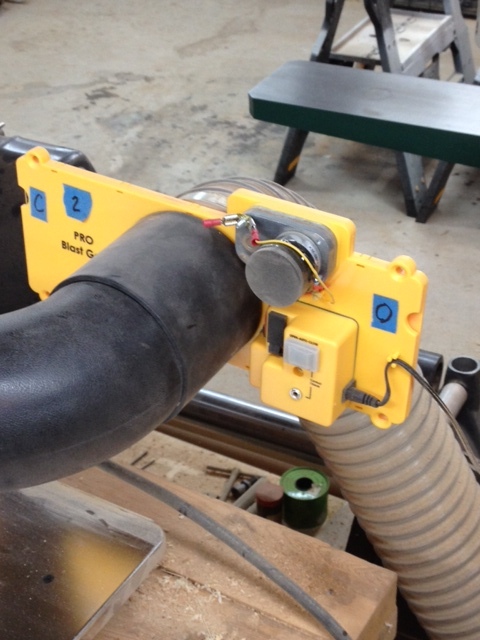 The optional blast gates work in sync with the equipment and the dust collector. What a time saver, and dust saver, and I can focus on woodworking instead of having to deal with turning on and off a dust collector and opening and closing blast gates! For a small shop like mine this is a dream, and for a larger shop it accommodates up to 4 iVac Pro systems, each capable of handling up to 8 tools. Below are 2 iVac Pro 220v Tools that control the dust collector and blast gates for my Grizzly GO490X 8″ jointer and Saw Stop table saw. There are numerous ways to customize the entire system to your needs, from setting the delays for the dust collector and gate closure, to even making sure that one gate is always open when your dust collector is on. There is a remote switch, and the customer service has been very good. The only issues I had are the plugs on the 220v switches and tools had to be replaced to fit the 220v outlets I had installed in my shop. 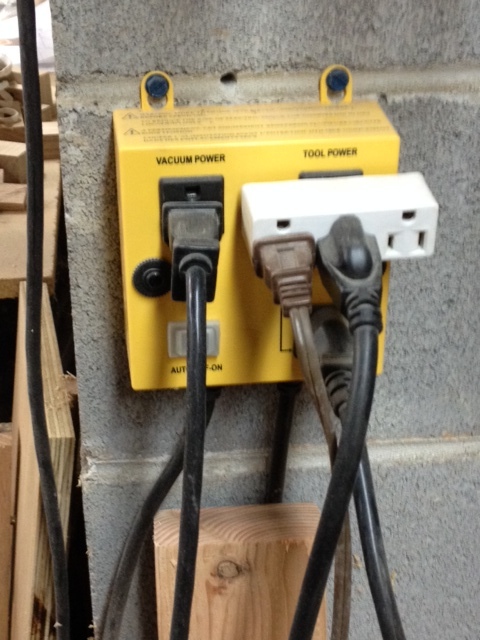 In order for iVac to get UL/CSA approval they had to use NEMA 6-20 plugs and receptacles. A quick trip to Home Depot fixed that and I replaced the plugs with plugs compatible to my outlets. Also, for a short period of time I had issues with the blast gate not staying open during the entire time a Tool was on. I was told there can be interference in the wireless signals from the various components with wireless phones, etc. This happened only a couple of times many months ago but I’ve had no problems since. iVac was willing to swap out the Tool for the dust collector which was out of warranty for a very reasonable price but the problem resolved on it’s own and has not happened since. Another small annoyance is that you have to run 120v power to the blast gates via a small gauge transformer wire which is easy to snag and pull out from the blast gate. But the signals between the Tools, Switches, and blast gates are wireless digital rf. Jump in with both feet, and get both the iVac Pro system and blast gates, you won’t regret it. I recently needed a router plane for some inlay work to clean up the groove bottoms cut on my router table. So I proceeded over to the local Woodcraft to see what they had. I discussed it with Steve Quehl, the owner of the store who is a big hand tool aficionado, and he suggested a Lie Nielson small router plane. Most anything LN makes seems to be hundreds of dollars, but this little baby was about $80. What the heck. But which one should I get? He suggested the closed throat so that it could be used for a mortise on an edge. He also mentioned that he saw Will Neptune use a clear acrylic base on an open throat model to accomplish the same thing. That apparently did not register on me because I ended up buying the closed throat. I got back to the shop and immediately tried it out. I dropped the blade to the bottom of the groove I had made on the router table, tightened the knurled knob, and gently pushed. It didn’t budge. I pushed harder and it started to take a sizably thicker shaving than I intended to take. What a bummer! Is this how it’s supposed to work? I’ve seen them used before to make the groove depth uniform, but this one was especially hungry. On closer examination I realized, since the blade is angled down slightly, that when I tightened the locking knob it was pushing the shaft back and the blade down. How you say? Not sure, but assuming the opening the shaft moves in is wider at the bottom than the top, it would certainly be possible. So I called up LN customer support. The acknowledged that it was possible and there could be a problem. We even discussed an new micro adjuster they were getting ready to produce similar to the adjuster on their larger router plane. That sounded good. Of course they were more than happy to replace mine, but since I had just bought it that same day I went back and explained the situation to Steve. Sure enough, it did the same thing in front of him. We tried another, the open throat model, and viola, it held the setting perfectly. Problem solved. This just goes to show that the best of brands can have issues. That doesn’t make the brand bad at all, because most everything I’ve bought for my shop has had to be tweaked in one way or another to get it to work right. The proof in the pudding is how they stand behind it. With Lie Nielson and Woodcraft, that certainly is not a problem.